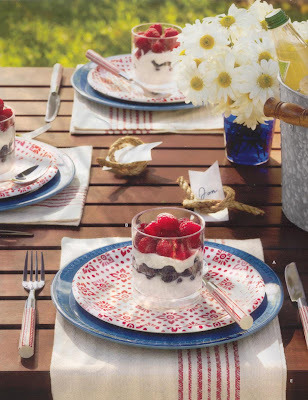 I saw this table set up in a Pottery Barn catalog last month and thought it was so cute for a 4th of July BBQ, or any BBQ actually. I love the individual place mats, the plates, the bucket o' drinks and my FAVORITE is the little rope name holder- love it! What an easy DIY ...I wish I had a backyard right about now. Ooh, I love this table setting!! I agree, I wish I had a backyard to entertain in! I'm a sucker for summer decorating with red, white and blue. That dessert fits in design-wise, and looks really yummy too! very cute! PB has some great photo stylists. I'm always looking past the product to see what else they use on page. Would also be fabulous for our Stampede decor...thank you...I'm now inspired to chic up Stampede!! I'm inspired to break out a blue glass and fill it to the brim with daisies; this is cute and totally doable! I can't wait for 4th of July BBQ!! Simply perfect for the 4th. It's so All-American. Even if you don't have a backyard, I have no doubt you will have a perfectly stylish 4th! I have to admit I LOVE red white and blue together and the 4th is a great excuse to put it together! (I sometimes feel slightly silly using it otherwise).